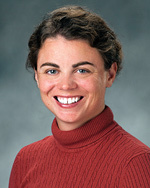 Darcy Murphy, MD, is faculty at the University of Minnesota Duluth Family Medicine Residency. Murphy grew up in Reedsburg, Wisconsin. She studied biology and secondary education at Kalamazoo College in Michigan. After college, she taught high school science courses and experiential outdoor education at the Albuquerque Academy in New Mexico and the National Outdoor Leadership School. She later attended the Medical College of Wisconsin in Milwaukee where she earned her medical degree and completed her Family Medicine residency in Duluth in 2012. After graduation, Murphy practiced outpatient medicine in Hermantown, Minnesota, and joined Duluth faculty in September 2016. She enjoys spending time with her husband and her young boys, hiking, traveling, gardening, yoga and reading.